A family-owned company, StoneCrafters began in 1969 as a floor covering business eventually selling granite tiles. Flooring customers began asking for granite counters, so naturally StoneCrafters began installing slab countertops. StoneCrafters takes pride in their word-of-mouth advertising by satisfied customers and has an enviable reputation for quality work and excellent customer service. StoneCrafters is a fabricator and installer of granite and natural stone materials throughout the state of Minnesota. We will work directly with you or your builder, making the process simple and streamlined. We fabricate and install kitchen countertops, bath vanity tops and tabletops. Our new 32,000 sq. ft. fabrication facility became fully operational in the fall of 2002. All of our machines are computerized with touch screen operations, assuring accurate and precise cutting and polishing. StoneCrafters is located in St. Cloud, Minnesota. The "Granite City" is recognized worldwide, in the stone industry, for its granite fabrication and workmanship. Our major stone slab suppliers are Cold Spring Granite, Stone Holding and Terrazzo Marble. Our Compliments. Selecting a Stonecrafters, LLC product is a wise choice. 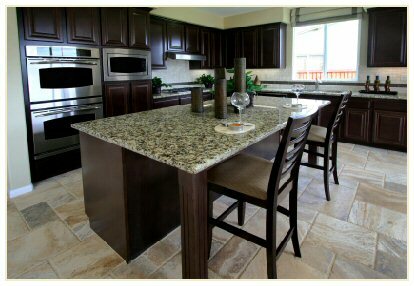 Granite is one of the most appealing and long-lasting natural products available. Stonecrafters, LLC is privileged to be the fabricator and installer of the material for your project. View StoneCrafters Inc. entire Certificate of Warranty (PDF). Satisfied customers are our best sales people. We have a reputation for exceptional quality and outstanding customer service. That is why Stonecrafters takes pride in the long-standing relationships we develop with our customers. Many of those customers have referred their friends, relatives and neighbors…that’s the best advertising we can ask for.